Residents can now apply for a permit to keep bees in the City of Cedar Springs, after the City Council approved an ordinance last month on beekeeping. According to the ordinance, it will be for an experimental period of two years. “To strike a balance between those who desire to keep honeybees and the concerns raised by others regarding possible problems with allowing honeybees to be kept in the City – and to allow the City Council to assess whether honeybees should be allowed to be kept in the City on a permanent basis – the City Council finds that permitting the keeping of honeybees on an experimental two (2) year basis is the appropriate intermediate compromise solution,” reads the ordinance. A person will need to apply for a permit from the planning commission to keep bees. Letters will be sent to all those with adjacent properties informing them of the person’s intention to keep bees. If anyone objects, that objection will be given to the planning commission along with the application. Other factors relevant to the applicant’s particular circumstances. A beekeeper must follow all guidelines in the ordinance, including: Keep no more than a total of two hives on real property less than 10,890 square feet; no more than 4 hives on real property less than 21,780 square feet; no more than 6 hives on real property less than 43,560 square feet; and no more than eight hives on real property more than 43,561 square feet. The City of Cedar Springs may soon join the ranks of other progressive cities that are helping to support the environment by allowing residents to keep bees. The City Council will consider the first reading of the ordinance at their monthly meeting this Thursday, September 7. “Bees are animals and no animals shall be kept except for the ones listed or are commonly classified as pets, which bees are not,” explained City Manager Mike Womack. Womack gave the council a copy of the beekeeping ordinance in Traverse City, and a draft ordinance for the Planning Commission and City Council to consider. This green box is Frank’s beehive, and the two white boxes are honey supers, which collect honey. Courtesy photo. 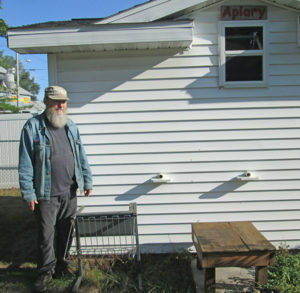 Frank’s hive is a green box inside a shed on his property. 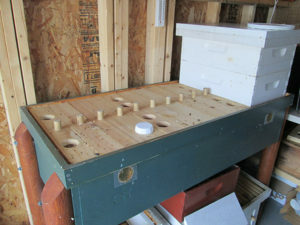 There are ports from the hive for the bees to travel through to get outside. They do not fly around inside the shed. “They are not dangerous,” he explained. “There are already bees flying around outside. They have to live somewhere. Better in a hive than in the wall of your garage,” he noted. At the August 10 council meeting, former Mayor Mark Fankhauser stated that he supports and recommends allowing bees in the city. He said he has seen a direct increase in the number of flowers as a result of Frank’s bees. According to Ranger Steve Mueller, our resident wildlife and biology expert, bees are more important than butterflies as pollinators and are not dangerous. “Bees are experiencing population decline for a variety of reasons and can use human help. They are of great positive economic importance. People have an unreasonable fear of bees. Riding or driving in a car is a greater health threat than bees in the neighborhood. Why people develop unhealthy fear of bees and other insects makes little sense but many are taught unreasonable fear as a child and hold on to those fears throughout life,” he explained. “[Bees] are a community-building, economic resource that benefits people, plants, and wildlife. I encourage people to maintain a portion of their yard for wildflowers and native species to help maintain and sustain biodiversity. Bees are an essential component if we want plants to reproduce,” he remarked. Mueller said he has a friend that lives close to downtown Denver, Colorado and she has a small beehive in her backyard. “The bees fly about the city in nearby areas pollinating flowers, gathering nectar, and make honey. We eat at their picnic table in the backyard and are not disturbed by bees. We watch them at flowers in the garden that surround the picnic table. We sit on their deck to enjoy the day and have had not problems with the bees that are about 30 feet away. She suits up to open the hive to extract honey and uses normal bee keeping practices for safety,” he said. Under the proposed ordinance, residents would need to apply for a permit. They could keep no more than a total of two hives on real property less than 10,890 square feet, no more than 4 hives on real property less than 21,780 square feet, no more than 6 hives on real property less than 43,560 square feet and no more than eight hives on real property more than 43,561 square feet. Honeybees must be housed in a properly designed and constructed hive, which may be located only in the “rear yard” of the property. They also cannot be any closer than 10 feet to any property line of an adjacent property. Frank said he was happy with the draft ordinance the council is considering. “The State of Michigan has guidelines for beekeeping and the proposal is in line with the State of Michigan Agriculture guidelines, which I think is a good way to go,” he said. A few of the other cities that allow bees in West Michigan include Grand Rapids, Muskegon, and Holland. Please note that this article has been updated to refer to the specific ordinance under which bees are not currently allowed in the City of Cedar Springs. We also removed Rockford as a city that allows them. It should have read Muskegon. We apologize for the error.